Clapton and Richards at Crossroads. 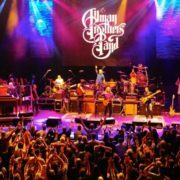 In honor of the November 19 release of Crossroads Guitar Festival 2013 on Blu-ray and DVD, I present my report from the two-day festival. The story originally appeared in Guitar World. Crossroads DVD is also available from my friends at Hittin The Note. 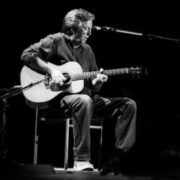 Eric Clapton spent a lot of time on stage at his two–night, 10-hour Crosroads Guitar Festival, held April 12-13 in Madison Square Garden. He opened the event with a five-song acoustic set on Friday and closed out Saturday with his band. In between, the host often became a most welcome guest. Strat in hand, Clapton traded licks with a wide range of the performers he had personally selected to be there. He also spent a lot of time smiling. Slowhand smiled sitting next to B.B. King, Jimmie Vaughan and Robert Cray for “Every Day I Have the Blues “ as Vaughan ripped off a twisted, solo filled with jump blues feints and Chuck Berry jabs, and B.B. surprised everyone including the acolytes by his side as he played counterpoint, digging out some tasty new licks. Clapton smiled when he joined Los Lobos for a rip through their “Tin Can Trust.” He dug in deep for a couple of twisty, swing jazz tunes with guitarist Kurt Rosenwinkel. 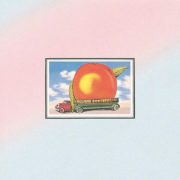 He probably smiled widest when he joined the Allman Brothers Band for Derek and the Dominos’ “Why Does Love Got To Be So Sad.” The song ended with a long coda featuring Clapton and Derek Trucks weaving guitar nirvana, a moment made all the more special by the fact that Trucks was playing the very guitar Duane Allman had used on the original recording – his 1957 goldtop Les Paul. “Eric likes having different people around to challenge and inspire him and I think that’s the first criteria of who he invites to Crossroads,” says Trucks. This was the fourth Crossroads Festival, which have settled into an every-three year pattern. The events are fundraisers for the Crossroads Centre, a drug and alcohol rehab facility Clapton founded in Antigua in 1997. The first was in Dallas in 2004; the last two events were day-long festivals in a Chicago stadium. 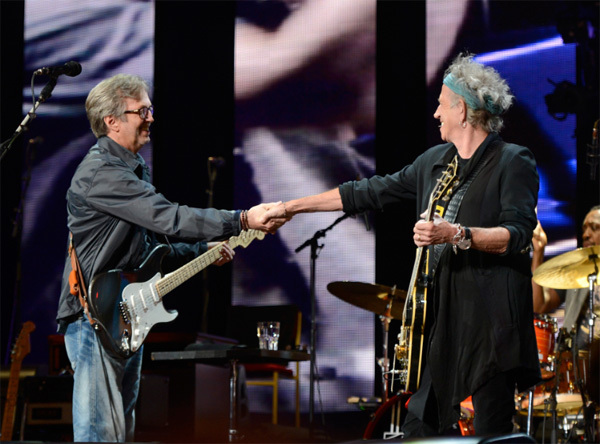 There was nary a letdown throughout the two nights, though Clapton’s decision to have guests Robbie Robertson and Keith Richards each sing two songs with his group was odd. Richards electrified the crowd with his appearance and did a great job on “Key to the Highway,” but he charm faded a bit on Chuck Berry’s “Sweet Little Rock ‘N Roller.” As a singer, Robertson is a great guitarist, though he did manage a moving “I Shall Be Released,” dedicated to his deceased Band-mates. Earlier, Jeff Beck led his group, which featured a violinist and bassist Tal Wilkenfeld, through a set of instrumental music before being joined by belter Beth Hart for a pair of songs, including “I Ain’t Superstitious,” which he recorded on his 1968 solo debut Truth. Buddy Guy was his magnetically manic self, joined by his 14-year-old prodigy Quinn Sullivan and pedal steel ace Robert Randolph. Country star Keith Urban lit up John Mayer’s excellent set on Friday and joined Vince Gill and Albert Lee Saturday for some super hot country picking. Urban played the Beatles’ “Don’t Let Me Down” with Mayer and the Stones’ “Tumbling Dice” with Gill. B.B. at Crossroads feeling the love of the crowd. 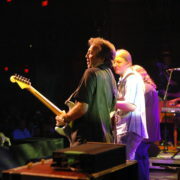 Vince Gill said he especially enjoyed Trucks sit in with Sonny Landreth, a meeting of slide masters. “Each of them combines technique and emotion in a really unusual and remarkable way,” Gill says. 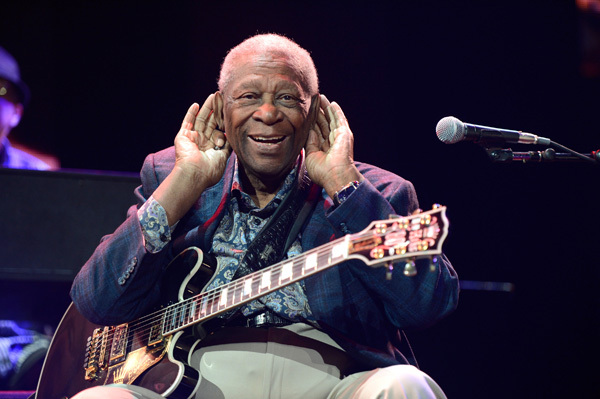 Haynes loved watching Beck, Clapton, Los Lobos and jazz guitarist Allan Holdsworth – “a guy so many of us guitarists have been inspired by” — and having Taj Mahal sit in with the Allman Brothers for “Statesboro Blues.” Taj’s 1968 version of the blues classic was the Duane Allman’s inspiration not only to learn the song, but to teach himself slide guitar. Crossroads’ finest moments revolve around such collaborations, and the simple fact that everyone plays better in the company of other standard bearers. 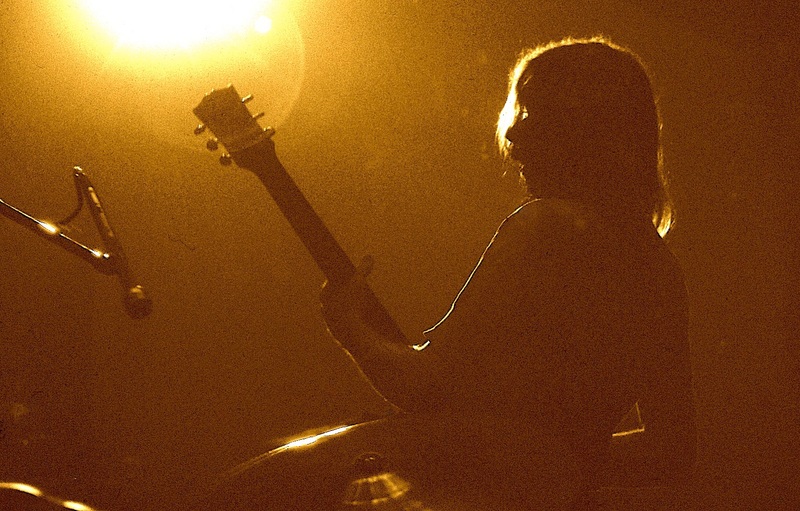 With so many great guitarists marching on and off the stage, the most memorable performances came from those who could harness the energy of the event and dig into deeply emotional moments. Doyle Bramhall 2 channeled Albert King with Clapton and was riveting in his own set, which reached a fever pitch when singer Alice Smith sang the powerful emotive blues ballad “Cry.” His whole set was a searing psychedelic blues fest; his band was also joined by Citizen Cope and Gary Clark Jr., who appeared repeatedly, fronting his own band and playing a hard-driving solo set. Clark burst into the public eye with this appearance at the 2010 Crossroads. 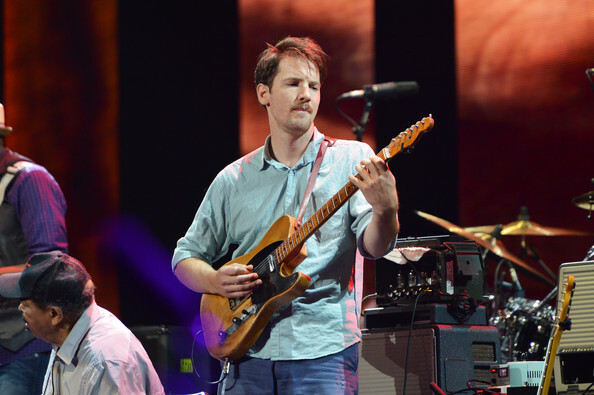 This year’s surprise performers included jazz cat Rosenwinkel, who had Clapton join him for two songs and also backed Holdsworth for an intense, hard-driving “Gamma Band.” It took the guitarists a few minutes to find their way with each other before they turned the inward track inside out. 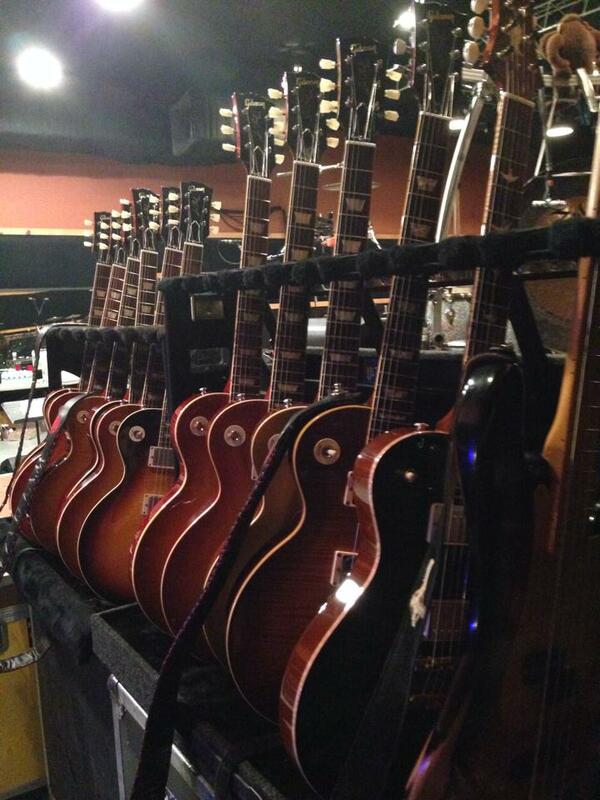 Derek Trucks with Duane’s 57 Goldtop, Warren Haynes, Eric Clapton. Mills was invited to the festival when Clapton heard his playing on a Natalie Manes song on Grey’s Anatomy. “I played slide on the end and Eric liked it and called Derek to see if it was him – which was a compliment enough,” Mills recalls. Clapton made some inquiries, found out Mills was the guitarist and sent the 26-year old guitarist a letter of invite. He was in the club. Vince Gill, the country super picker who has played at all four Crossroads Festivals, remembers when he got invited the first time. Len Bias, 1963-1986 Willin’ – Little Feat Bio. Lowell George!